Clearly I am aware of the fact that today is 4/22 and not 4/20. I didn't really think about the date until I was pouring some soy milk into a coffee cup (I ran out of creamer at work) and noticed the expiration date. It was 4/20! Holy moly! Being a stickler for expiration dates I immediately poured out my cup, rinsed it out, and poured the rest of the soy milk down the drain. There goes eating a bowl of cookie crisp later this morning. Oh well it's better to skip the bowl of cereal than seeing what happens if you drink expired soy milk. With only 2 days left until the wedding I know a work out is in order today. Yesterday was another day off due to game 2 of the Magic/Bobcats playoffs. Today I'm only working until 11:00am so there is no reason why I can't fit a nice, longish run around Lake Eola into my day. Maybe I'll even work out shoulders. If I'm feeling really crazy I might throw in some ab work. Hopefully I'll stay this motivated in 4 hours. I managed to do a pretty pitiful work out yesterday after work. I was frustrated about an inconsiderate wedding guest and didn't really feel like exerting myself much in the gym. I was able to knock out 20 minutes on the elliptical and then 15 minutes on the stationary bike. Lame. On to more exciting news ... I made myself a smoothie this morning and added an extra ingredient. Crazy, right? This time I used vanilla soy milk, 1/2 banana, 1 tbsp honey, and .... extra firm tofu! We had some leftover from Sunday lunch so I figured why not toss it into the blender. The result is a super creamy, slightly nutty tasting smoothie. Not a bad way to start the day. Oh yeah only 4 more days until the wedding. YIKES! After taking 2 days off from working out I had a lot of catching up to do on Sunday. I decided to do 1 hour of cardio, split up on 3 different machines. I did 30 minutes on the elliptical, followed by 15 minutes on the bicycle, then finished off with 15 minutes on the treadmill (on a 1.0 incline). By the end of the 60 minutes I was definitely sweating and my legs had begun to feel fatigued. Then I headed to the weight area and did 3 different biceps exercises, 3 sets of each. I finished up my lengthy work out with 125 crunches. It's safe to say that the next 4 or 5 days (yes including wedding day) will be filled with fitness. The race last night was madness. There were 12,600 runners who had signed up for the race. I know that at least one runner was not at the race, and that was Chris since he opted to skip it and just drink beer. By the time 7:15pm rolled around (the start of the race) I was starving. The thought of running 3.1 miles on an empty stomach was daunting. I knew we were eating at Metro Espresso after the race so I used that as my motivation. It felt like I was chasing after a gigantic pizza pie in the sky. 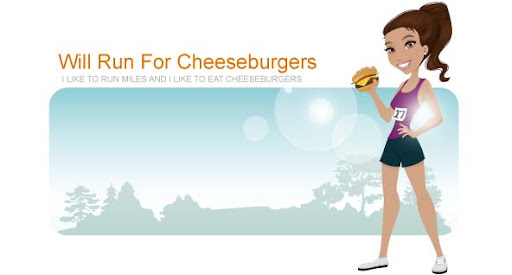 Sadly I didn't have my best time ever, which proves that eating cheeseburgers before a race is still the best meal for fast results. I did however finish in 26:30 minutes which isn't too terrible. Plus I decided to run without my ipod which I don't think I like doing since the music definitely helps tune out all of the annoying noises around me (ie. guys with heavy breathing) and helps even out my tempo. Once we made it to an outside table at Metro we quickly ordered an order of garlic knots and extra large Pizza Picante. The garlic knots were disappointing; not nearly enough garlic or cheese. The Pizza Picante was perfect. We ordered half without pepperoni and only with the pepperoncini peppers for the vegetarian at the table (me). Two slices per person was seriously not enough but eating any more than that would've teetered on us being excessive. The boys had all polished off turkey sandwiches, bags of chips, and multiple cookies at Mike's company's tent after the race. All in all it wasn't a bad way to end a Thursday night. Today is the Corporate 5k in downtown Orlando. Part of the course is literally right outside the VUE so convenience is definitely not a problem. We are also fortunate to run as guests of a Rockwell corp. employee (Mike) so our entry fee was paid for. This is probably the busiest 5k of the running season with thousands upon thousands of runners participating. The end of the race even features a beer tent filled with kegs of Michelob Ultra. I've run this race in the past and even was the team captain for a Bank of New York Mellon team last year. We ended up placing first in the banking industry category. This year I had no desire to head up another team since most of the department had already been laid off. Plus not paying the $25 entry fee was definitely a factor in not continuing a bank running team. It is week 3 of not eating meat so eating a cheeseburger was out of the question before today's race. Instead I just ate 2 peanut butter and jelly sandwiches. Both were made on Arnold Select Sandwich Thins. This is the second pack of sandwich thins that I have purchased and have enjoyed them quite a bit. Although I am a big lover of big doughy bread served warm out of the oven (usually drenched in butter), I prefer less bread in my sandwich and more sandwich filling instead. Since I'm limited on vegetarian sandwich choices the peanut butter and jelly sandwiches have been some what "flat" but I guess that's the point. That and less calories. We'll see if eating pb&j before the race helps me race as fast as I do when I eat cheeseburgers. Do you have those friends that act like little devils, sitting on your shoulder, encouraging you to do bad things? I have a couple of those friends (sometimes my fiance even falls into that category). Last night we went to Tijuana Flats for buy-one, get-one free entrees. Ryan and I agreed that the only way we could indulge ourselves for yet another meal, was if we worked out beforehand. I ran 2.3 miles on the treadmill in 22:30 minutes (0 incline) and did 3 shoulder exercises and 100 crunches. On our walk over to T. Flats we texted Chris and told him to meet us there. Him and his roommate, Mike, both joined us in eating delicious, affordable food. Each duo started off with a pitcher of Dos Equis beer. After we were finished eating I figured it would be time to go home. Thanks to the 3 enablers sitting at the table we ended up drinking way more beer than anticipated for a quiet Monday night. It started with Mike buying a third pitcher then Chris bought a bucket of beers. I felt like it would never end. Had I not protested further I feel that we might still be sitting at that same table drinking Mexican beer. So while sitting across from Chris and Mike, listening to them bicker back and forth about the current real estate market, it dawned on me that they were human versions of those lovable Sesame Street characters, Bert and Ernie. 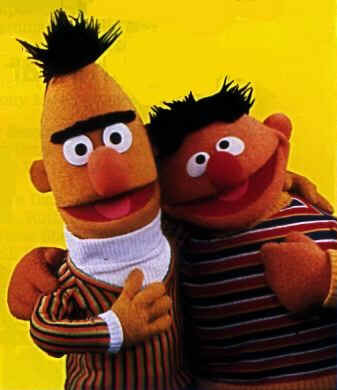 Chris is the tall and serious Bert and Mike is the shorter more lovable goofball Ernie. Since neither of them read my blog I figure they will never know about my comparison. It probably doesn't help their cause that they are roommates and are always together. I wonder which Sesame Street character I am similar to. Ryan would definitely be the Count. He has his counting technique down pat. It feels like I took a really long break from working out. I've managed to keep up with running but eliminated weight training since doing shoulders on April 1st up until last night when I brought the weights back. Last weekend Ryan and I ran on Saturday and Sunday around Lake Eola. Saturday was 2.5 miles and Sunday was 3.59 miles. I tried to keep up with the outdoor running and did 3.22 miles on Tuesday (along with 100 crunches) and 2 outer loops around the lake on Wednesday. I took Thursday off and then dragged Ryan outside on Friday for 2 inner loops around the lake. I managed to skip running on Saturday and only did 2.0 miles in 20 minutes yesterday on the treadmill (at an incline of 1.0 the entire time). I also did 100 crunches, 3 bicep exercises, squats, and calf raises yesterday. With not much time left to work out before the wedding, the frequency of work outs is going to increase dramatically. Wednesday is my final dressing fitting so let's hope I haven't gained or lost any weight! No matter how early I set my alarm clock in the morning I always manage to run out of time. This morning was no different. As Ryan walked Honey outside I decided to start making breakfast and my lunch for work. Since Ryan has been doing his South Beach diet, phase 1, he hasn't been eating carbohydrates. His breakfasts have consisted of eggs, Canadian bacon or turkey bacon, cottage cheese, and a glass of tomato juice. I made myself an egg and cheese sandwich since I'm not eating meat yet (2 weeks so far). Breakfast was finally done and I had just poured myself a glass of delicious orange juice when I realized Ryan needed his drink too. So I hastily grabbed the bottle of tomato juice and as I opened it I ended up spilling some down my body (stomach, leg, foot, then floor). What a mess. Not to mention I was already running late so cleaning the floor and myself up took away some more time. Luckily I still made it to work in time and I'm already done with my first blog for Thursday. Guess this day isn't starting off too badly. There were two different cases in the past two days where a friend of mine was driving on the highway and was hit by a drunk driver. In both cases each friend managed to walk away with no real injuries. One friend's car had a few scrapes and dents and the other friend's car was completely totaled. Luckily my friends were not badly injured. These situations make you look at your own life and wonder if you've been living your life to its fullest; if you've told the special people in your life how much you loved/appreciated them lately. I'm usually a planner with everything in my life. Once in a while it's ok to be spontaneous and buy concert tickets in two different cities for the same act. Especially if its a musician that you really enjoy listening to, such as Jack Johnson. Worst case I end up selling a pair of the tickets. At least I won't end up sitting back and missing out on his concert. I gladly took Wednesday off from working out. I was starting to feel sore from the interval training the two days before and figured keeping off my legs would be good. I did stay active though and walked around Lake Lily (in Maitland) with Honey, Katie and her dog Emma, and Katie's roommate Carrie with her dog Brady. After walking 3 times around the lake we headed over to Qdoba for some dinner. Mexican restaurants are the easiest places to eat at if you're trying to eat meatless meals. I opted for their "pick 2 deal" and got a cheese/black bean quesadilla and small salad. Yesterday I was feeling even more sore than before. To the point it was almost painful to walk. That didn't stop me though from running 2 miles on the treadmill at a very slow pace (20 minutes total time). Then I did 3 shoulder exercises and finished up with 125 crunches. It actually didn't hurt as much to run as it did to just walk. I completed my first week of being a pescetarian last night at Mucho. I had a black bean and cheese chimichanga ... or at least I tried to eat it. It was gigantic! I managed to eat 1/3 of it before passing it on to Ryan. He gladly devoured it after finishing the habernero challenge.